Deux nouvelles traductions viennent d’arriver dans ma boîte aux lettres. 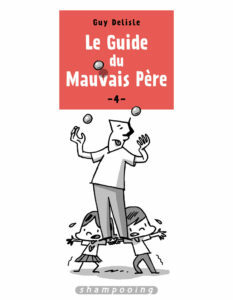 Cette fois-ci, c’est au tour du Guide du mauvais père, en anglais et en néerlandais. I have an unrelated question for you: In Burma Chronicles you mention making a little picture book for children with HIV, Millie’s Angels, I think it was? Is that available anywhere? (Meanwhile I shall order A User’s Guide to Neglectful Parenting for my brother and his wife, who are new parents! I only have a copy of that little book. I don’t think it’s available. Even in Myanmar, i don’t think they have reprinted it. Too bad about Millie’s Angels! But thank you for letting me know. Back to A User’s Guide to Neglectful Parenting: My copy arrived, and I laughed so much. (Even though it’s a present for my brother, I wanted to read it first.) I loved the one where your daughter shows you her drawing and you end up in a rant against wanker cartoonists. I also loved the one where you end up giving Louis very detailed Zelda advice. My daughter was trying to figure out which Zelda game it was that he was playing, based on your advice!